Recently a loved one was in critical care in the hospital for an extended stay. Pierce sent his beloved Woody to provide comfort and hugs. Unfortunately, Woody had other plans. In fact, Woody got in A LOT of trouble in the hospital. We received daily photos and videos and if it wasn't one thing it was another. Woody is lucky the nurses didn't kick him out with all the time outs they had to put him in. Turns out Hospital Woody was a bad influence. The more Hospital Woody sent emails and videos of himself getting into trouble, the more the Woody that stayed at home got into trouble. Seems both Woodys came from the wrong side of the toy store. Or Toy Story? For a happy ending, our loved one is resting much more comfortably at home now, and hopefully Hospital Woody will behave himself from now on. nice sharing Lisa , happy valentine! This was so funny! I'm so glad your loved one is doing better. Thats cute! Have a blessed day! I'm glad your loved one is better. 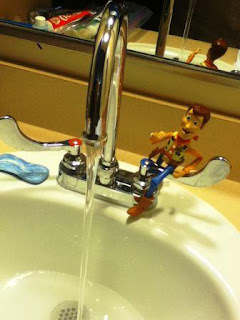 I think you need to put woody in time out! !!! Happy V day hope your husband doesn't forget the card. 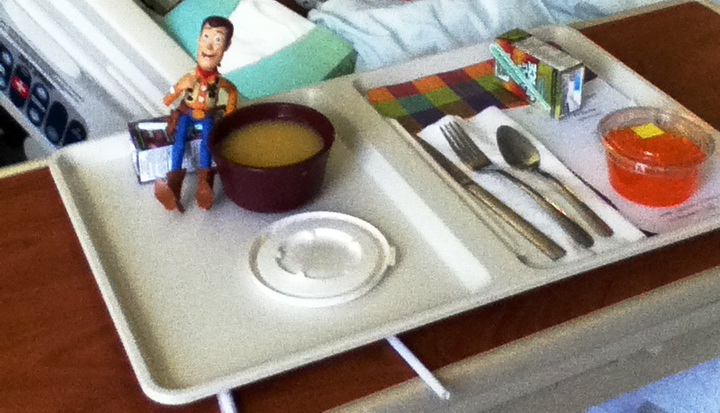 Everyone should have a naughty Woody while in the hospital. Glad the loved one is doing soooo much better. Hospital stays are for the birds. Happy Valentines Day, Lisa!! Glad things are looking up. How sweet of Pierce to give up his dear Woody. I think he was just rying to get kicked out of that hospital! So glad your loved one is better! That is cute! 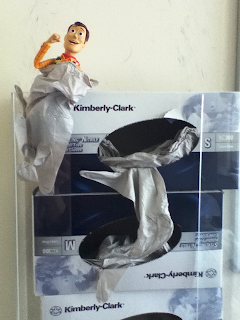 Looks like mischievous Woody helped to alleviate some of that hospital boredom! So sweet of Pierce to be so thoughtful! priceless!!! if i ever have to stay in an "h word" place, i'm gonna send for woody! I'm glad your loved one is resting at home. I hope Hospital Woody settles down! At least Pierce didn't send Buzz Lightyear! How sweet of Pierce to share and what a great experience that Woody had! Happy to hear your loved one is resting at home. Happy Valentine's Day! Glad this story had a happy ending after all! Can you imagine the trouble Woody and Roamy could get into? poor Woody...he needs to make better choices! love the breakfast you prepared yesterday-that is terrific! How cute and sweet. Pierce gets an A for his thoughtfulness. So glad loved one is better. 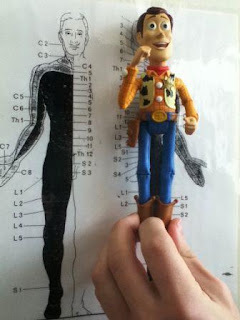 I bet Hospital Woody made life easier for your patient. That Woody...such a trouble maker. Loved it! Glad he did not pull that string. So cute!! I hope you have a great vday! Lol! That Woody is trouble! I love that Pierce was willing to part with him to help someone have a better stay. I hope your loved one is doing better. 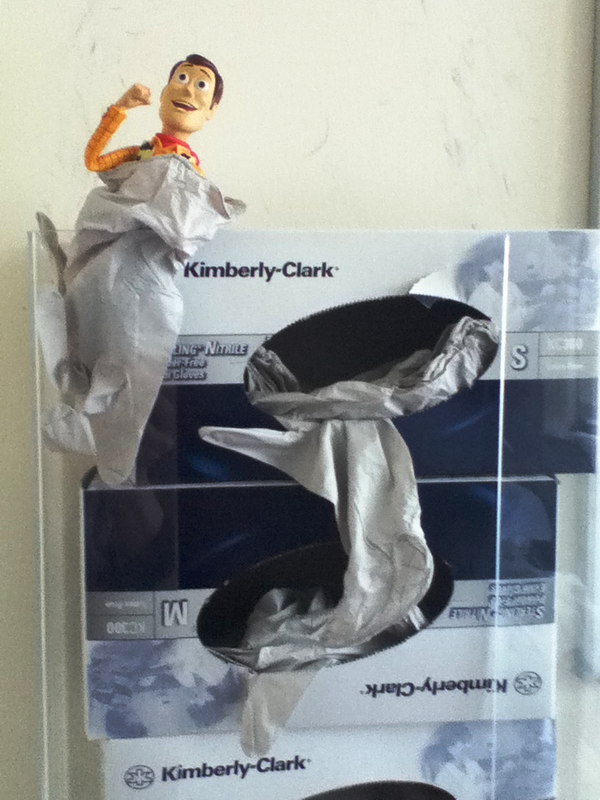 That Hospital Woody sure was up to no good!!! Very cute post!! This is an absolute scream!!! A wonderful Valentine's Day gift for all of us, the gift of laughter! I remember a couple years ago when Anne Marie pulled the nurses cord in the hospital, yikes! We knew nothing till the nurses came running. Your Monday lunch is so adorable, I love the crown bowl. And wonderful pictures of the twins amusing themselves while you were weeding! Happy Valentine's Day, Lisa!! Now I thought Woody was the one we could count on to behave. Buzz, I'd expect this from, but Woody....shame, shame, shame. I bet Pierce got a kick out of the photos and videos. Glad to hear all is well with your "loved one". Love this post! My coworkers and I did something similar to this but with a Budah statue that a doctor got as a gag gift. He visited many places in the hospital, construction sites, firehouses, and even Idaho each with there own ransom note. I hope your kids enjoyed it. I know we did! 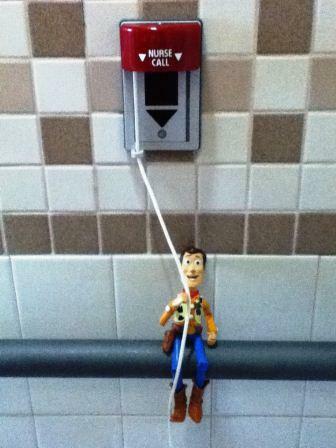 Looks like Hospital Woody was having some fun! ---Glad things are better for your loved one. We hopes Woody is better! Glad your loved one is home and resting comfortably. I just love Woody, thanks for the laughs! That is really cute! I'm glad to hear the your loved one is well. I'm glad your loved one is better. The photos and captions are just too funny! Loved them! Our Woody hasn't travelled this extensively but recently Naveen has taken an intense interest in his whereabouts.